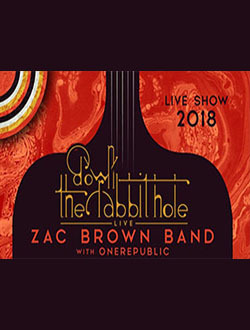 Multiplatinum GRAMMY Award-winning artists Zac Brown Band will kick off their summer tour “Down The Rabbit Hole Live: Zac Brown Band 2018” with stops at some of America’s most iconic baseball parks. With two nights at Fenway Park and Citi Field, the tour will also see ZBB open as support for the Eagles at AT&T Park and Petco Park. 2017 was a record-breaking year for Zac Brown Band as they sold out shows at Denver’s Coors Field and Chicago’s Wrigley Field during their 40+ date 2017 “WELCOME HOME” North American tour. The band played to over a million fans on last year’s tour, which Billboard described as “an epic show run”.